Using safety goggles in science class is necessary for safe, active learning, but it is important to protect your eyes in class. Choosing the right goggles and using them appropriately is critical to ensure the laboratory experience is a good one. Science classes are not inherently dangerous, but when students work with strong chemicals, fast moving objects, and other unusual materials, there is greater potential for accidents and injuries. Different science classes have different risks depending on the types of experiments the students perform, the equipment they use, and their behavior in the classroom. Biology: Dissections may involve sharp instruments that could cut students, resulting in hazardous bodily fluid spills. Furthermore, preservation chemicals used on tissue cultures can be toxic. Chemistry: Strong chemicals and chemical reactions can create splashes, fumes, and dust that can irritate or damage eyes. Dropping test tubes, beakers, and flasks can also create dangerous shards of glass. Anatomy: Students in more rigorous anatomy classes may encounter human bodily fluids or may be growing dangerous cultures that could cause infections. Physics: These classes may use rolling, falling, or thrown objects to measure different physical laws, and eye protection is necessary to safeguard against projectiles. Earth systems: Studying ecology, geography, and other Earth sciences may lead to experiments with sharp objects, toxic plants, or other items best kept safely away from the eyes. Geology: Advanced geology classes may break rocks to examine their strata, and sharp shards and rock dust can irritate or injure eyes. 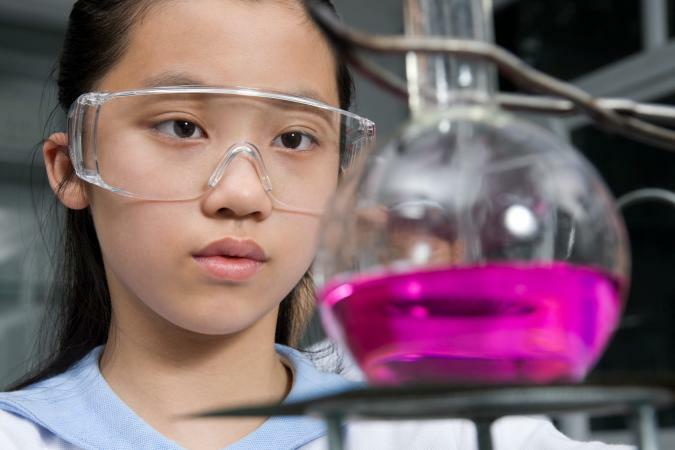 Students in these and other science classes should use safety glasses and goggles to ensure that students have productive but safe learning experiences. There are several different types of safety goggles available, and students in the science classes should use the goggles best suited to each type of experiment. For some classes, this may mean that students need multiple pairs of goggles, though other classes - depending on the experiments they do - may not need goggles at all. Splash goggles: These designs are specially coated to resist chemical splashes. They should provide full coverage to the eyes, including wrapping around to the temples to protect against side splashes. Form fitting designs are popular and elastic bands can adjust to fit every student. Most designs include vents for comfort, and more expensive goggles may have anti-fog coatings. Impact goggles: These safety goggles are designed for science classes and laboratories where flying objects may be a hazard. Constructed from rigid materials, they are impact resistant and can protect against wayward projectiles. Ultraviolet goggles: Some science classes, such as physics, Earth systems, or astronomy, may work outdoors frequently and goggles that protect against excessive ultraviolet rays are necessary. Some lab equipments also use ultraviolet rays to detect chemical residue, and these protective goggles should be worn as a precaution. Safety glasses: Less sturdy than more elaborate goggles, these simple designs are suitable for when students are observing a demonstration, or for classroom visitors who are not directly participating in the lab. Face shields: These visor-like shields can be worn independently for low-risk activities or can be combined with other safety goggles when extremely hazardous materials are used. While safety goggles are essential equipment for every science classroom, they are not adequate by themselves to protect against every laboratory risk. The classrooms themselves must be safe and equipped with proper safety gear, and both the teacher and the students should follow safe behavior. A safe lab classroom is one that is not overcrowded and has enough room for students to safely work in the lab. In case of an emergency, the teacher should be able to quickly get to students in danger. Unfortunately, many classrooms are overcrowded but this danger can be solved by rotating students into the lab in small, carefully supervised groups. The lab should also be organized so equipment is not misplaced or confused and safety equipment can be located quickly. Wear appropriate clothing that will not interfere with the experiment. This includes wearing shoes that cover the whole foot in case of spills and tying long hair away from equipment and open flames. Read all instructions and warnings carefully for each experiment. Avoid horseplay and inappropriate equipment use. Ask questions about procedures if anything seems unsafe or uncertain. Keep the lab area clean to avoid accidentally mixing spilled chemicals or creating a dangerous situation. Wearing safety goggles in science class should be as much a part of a lesson as writing one's name on an assignment, taking attendance, or turning in homework. With proper precautions, students can safely participate in practical, educational laboratory exercises.